Nothing says honoring the memory of Trayvon Martin like vandalizing a police care and wring “Kill Pigs” on it … This is what happens when so-called Civil Rights leaders gin up emotions and holler “no justice, no peace” and a willing liberal media supports the agenda. The authorities in Sanford, Florida had asked for the people to act responsibly in the wake of the George Zimmerman murder trail verdict. Although the individuals who were pro-Trayvon Martin were very disappointed and irate following the “NOT GUILTY” verdict in the George Zimmerman murder trial, there was really no rioting as the media had hyped and probably some what hoped for ratings. Many people protested the verdict outside the court house in Sanford and were in disbelief; however, they did it peacefully with their voices. That cannot be said as to what happened in Oakland, California. As reported by the AP, in Oakland, pro-Tayvon Martin protesters broke windows at the Oakland Tribune and started small fires in the streets and the Oakland marchers vandalized a police squad car and police formed a line to block the protesters’ path. Twitchy has much more including many pics of the vandalism in the name of Trayvon Martin’s no justice. 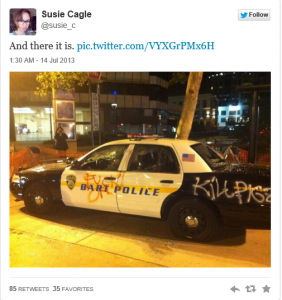 a police car parked outside the 12th Street BART Station had its windows smashed, and protesters spray-painted “F- the police” and “Kill Pigs” on the side of the vehicle. According to the San Francisco Chronicle, there have been no arrests made following the night of rioting. Protesters marched through the streets of San Francisco and Oakland on Saturday evening, upset at the acquittal of George Zimmerman in the shooting of Trayvon Martin in Florida. A BART police car parked outside the 12th Street BART Station had its windows smashed, and protesters spray-painted “F- the police” and “Kill Pigs” on the side of the vehicle. … the crowd soon moved away from the intersection and headed east on 14th Street, stopping at a McDonald’s restaurant shortly after midnight to burn several flags and to spray-paint “Kill Zimmerman” and “FTP,” an anti-police epithet, on the side of Alameda County’s Rene C. Davidson Courthouse. For more updates, read comments and tweets, and provide your own comments, go to Scared Monkeys Forum: George Zimmerman trial. How bad has the Obama and Democrat endorsed Occupy Wall Street Movement become … even Uber-Leftist Bill Maher denounces them, calls them D-bags and they should get a job. OWS has lost one of its most vocal supporters. Bill Maher on HBO’s ‘Real Time’ stated something that many of us have known since the inception of the Occupy Wall Street protests. Mahr found himself agreeing with Newt Gingrich that they should … “get a job.” He then went on to say, “… but now it’s just a bunch of douchebags who think throwing a chair through the Starbucks window is going to bring on the revolution”. BILL MAHER: Let me ask you about another occupation, because this is – and you would be good on this too, panel -, the occupation, the Occupy Wall Street, because similar to Afghanistan, when you occupy anything for too long people do get pissed off. And as I watch them on the news now I find myself almost agreeing with Newt Gingrich. Like, you know what – get a job. Only because, you know, the people who originally started, I think they went home and now it’s just these anarchist stragglers. And this is the problem when you, you know, when your movement involves sleeping over in the park. You wind up attracting the people who were sleeping over in the park anyway. MAHER: And I think that’s where we are now with the Occupy movement. They did a great job bringing the issue of income and equality to the fore, but now it’s just a bunch of douchebags who think throwing a chair through the Starbucks window is going to bring on the revolution. Actually, the reality is that #OWS has been doing this all along, the MSM just never covered or reported the rapes, assaults, murders, pimping out young girls, stalking of children, sexual assaults, vandalism or overall “douchebagedess” of the movement who Time magazine called their “People of the year”. Sorry, but who could have missed that these folks were anarchists and undesirables from the outset as they continually disobeyed the law, attacked the police and simply wanted to cause chaos. Oh yeah, because threatening the police, harming the elderly and threatening to torch NYC to the ground is a positive message of financial inequality. All the protesters have done is cost tax payer’s millions. Everyone knew from the outset what this movement was about; however, it has now escalated and the popular opinion of the OWS movement continues to fall and the rats are jumping ship. The classless fools of Occupy Dallas showed their true colors in throwing fake blood on the windows of Neiman Marcus. Because we all know that the Tea Party would have done the same, NOT! Wow, you showed them OWS. What a statement you made. What’s next taping “Occupy Me” signs to the walls? Photos of the Occupy thug life vandalism can be seen at Hot Air Pundit. A few minutes ago, Occupy Dallas posted to its Facebook page a note that two of its former members — which is to say, the group of protesters who split the camp before Dallas Police broke it up last week — were arrested for decorating the downtown Neiman Marcus with a little fake blood. We’re trying to confirm the arrests with DPD, but as you can see from Leslie’s freshly snapped photo, yup, some of its holiday windows are now a little less festive.